No, not you, Mr. Jones; we’d recognize you anywhere. 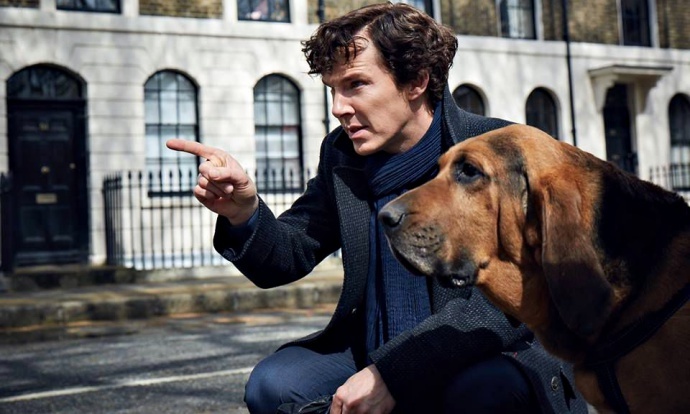 We mean Toby the dog from Arthur Conan Coyle’s The Sign of the Four, presumably that gorgeous bloodhound pictured with Benedict Cumberbatch (header photo) in the BBC’s first Sherlock, Series 4, promotion. The clues seem ripe for this particular retelling to heavily involve the fabulous Amanda Abbington’s Mary Morstan, although the timeline of her meeting and marrying Martin Freeman’s John Watson is slightly altered. If Steven Moffat and Mark Gatiss are headed in that story direction, could it be that Toby … Jones is playing Jonathan Small? Tags: 221B Baker StreetAmanda AbbingtonAndrew ScottArthur Conan DoyleBBCBenedict CumberbatchbloodhoundDI LestradeDr. John WatsonIs Moriarty Sherlock's brother?Jim MoriartyJohn WatsonJonathan SmallLouise BrealeyMark GatissMartin FreemanMary MorstanMolly HooperMoriartyMrs. HudsonMycroft HolmesRupert GravesSherlockSherlock HolmesSherlock Season 4Sherlock Series 4Sherlock Series 4 trailerSherlock trailerSir Arthur Conan DoyleSteven MoffatThe Sign of FourThe Sign of the FourTobyToby JonesUna StubbsWatsonWho is Toby Jones playing in Sherlock?